Europe Controlled Release Fertilizers Market size is likely to witness prominent growth during the forecast period. Controlled release fertilizers are also known as metered release fertilizers and are coated with polymers which regulate flow of essential nutrients to plants according to a fixed pattern or duration. The changing dynamics in European food economy and rising demand for food security shall be propelling controlled release fertilizers market over the forecast timeframe. Agriculture accounts for almost 40% of land in Europe, which is fairly a large number. Rapid industrialization has resulted in decrease in number of farms and increase in average farm size in past few years. This has created considerable pressure on agricultural land for meeting food demand of the growing population and reduce environmental impact of hazardous pesticides and pesticides. According to EU commission reports on mineral fertilizers, 2016, the European fertilizer industry has an annual turnover of 13 billion Euros and provides approximately 95,000 jobs across Europe. France held the largest share in Europe controlled release fertilizers market in 2017, followed by Germany and the UK. The country held the maximum share in terms of both, volume and revenue. France is blessed with agricultural diversity which creates scope for different types of fertilizers market. There were approximately 490,000 farms in metropolitan France in 2010 and it has the biggest utilized agricultural acreage (UAA) in Europe of nearly 30 million hectares. France was among the top 5 countries in 2008 using NPK based fertilizers according to the IFDC Worldwide Fertilizer Capacity Listings. The production and consumption has steadily increased from then and has opened new growth avenues for controlled release fertilizers market in past few years. 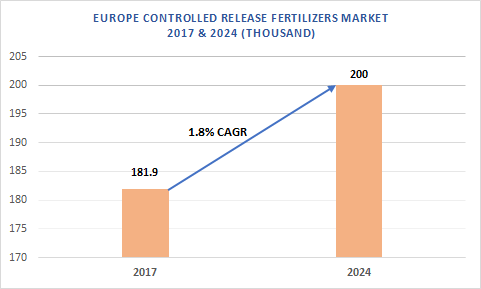 The major companies operating in Europe controlled release fertilizers market include Haifa Chemicals, Eurochem Agro GmbH and ICL Specialty Fertilizers.